House Tea Partiers Force Deeper Spending Cuts Of $100 Billion : It's All Politics Tea Party House freshmen have exerted their power, forcing their leaders to keep a campaign pledge. House leaders appeared ready to compromise on a campaign pledge to cut $100 billion in spending with $74 billion in cuts. House Speaker John Boehner leaves a Capitol Hill news conference, Thursday, Feb. 10, 2011. It has been a week of effective muscle flexing by the House's new GOP members as they contributed to the defeat of several pieces of legislation Speaker John Boehner and his leadership team thought would easily pass, like an extension of several Patriot Act provisions. 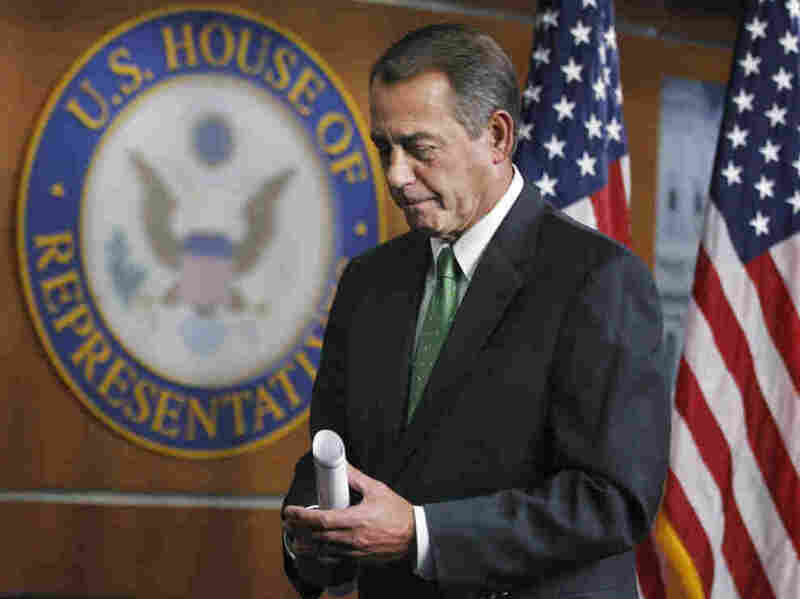 On Thursday, the new Republican lawmakers, many with Tea Party ties, showed their power again. They forced their leaders' hands on cuts of non-defense discretionary spending. The leadership had arrived earlier in the week at about $74 billion in cuts from President Obama's fiscal year 2011 budget. Not nearly enough, the Young Turks said. They wanted the $100 billion in immediate spending cuts called for on page 6 of the House Republicans' midterm election campaign manifesto known as A Pledge to America. So that's what they got. House Republican Appropriations Committee Chair Rep. Hal Rogers (R-KY) and other officials went back to the cutting board and found an additional $26 billion. House leaders are expected to release their revised list of cuts Friday. The turnaround was also a setback for the party's leading fiscal hawk and rising star, House Budget Committee Chairman Paul Ryan (R-Wis.), who unveiled the $74 billion spending plan last week and immediately faced questions about whether the proposal lived up to his tough talk about federal spending. Cantor said Thursday evening that the caucus was "uniting" around a plan to cut $100 billion, while Majority Whip Kevin McCarthy (R-Calif.) commended the 87 freshmen lawmakers for pushing through a tough decision for America. "What we heard here was a commitment to the $100 billion reduction number," Cantor said. "That is what we said we were going to do and that's what we are going to do." This isn't the first time a large freshman class has exerted itself in the House's modern history. It happened in 1994 with the large Republican class who were the foot soldiers of the Gingrich Revolution, and in 1974 with the reform-minded post-Watergate vanguard of Democrats who shook up the system. It's still early, but already the 2010 class has had a significant imprint on the 112th Congress, apparently forcing the leadership to make more adjustments than Boehner and his team had reckoned on. In Washington, high flying campaign promises are often the first thing to be jettisoned as lawmakers turn to the realities of governing. The new Tea Party freshmen are trying to force their leaders to play by different rules. What's happened also may mean Boehner and his leadership team must recalibrate how they approach getting the votes needed to approve the spending that would keep the federal government open past March 4 as well and raising the federal debt ceiling.